Recently I’ve been contemplating what makes one French village more lovely and desirable than another and came to the conclusion that it all depended on the day, time and season of the visit. Maybe I was very fortunate on the day we visited Saint-Léon-sur-Vézère: the weather was warm, the day bus visitors had vanished for the season, and the lunch offerings were most appealing. The village of around 500 residents sits right on the Vezere river which flows like liquid molasses, gently and lazily around the village and nearby woods. Sparkling miniscule mites buzz in the golden rays, the warm air tinted with the colours of Autumn. A leaf strewn walk beside the river, a crunch through carmine and russet, provides a wild contrast to the benign and domestic village. 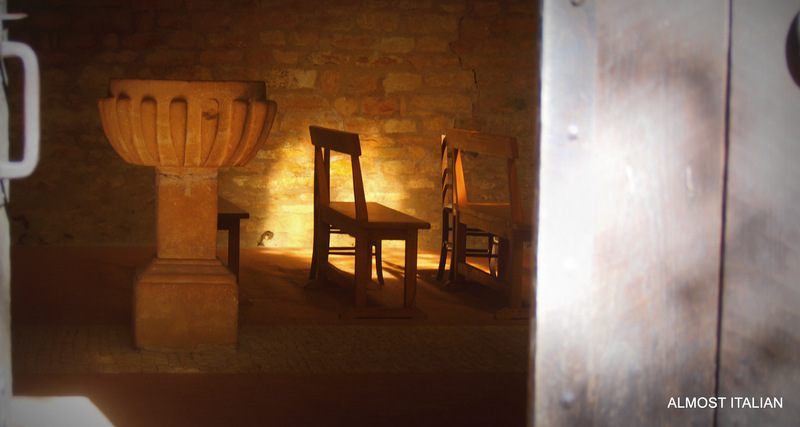 St Leon’s tastefully restored church invites quiet reflection. The hardest part of my fascination with this village is sorting through the prolific amount of photos I took on the day. Come for a walk around Saint-Léon-sur-Vézère with me. 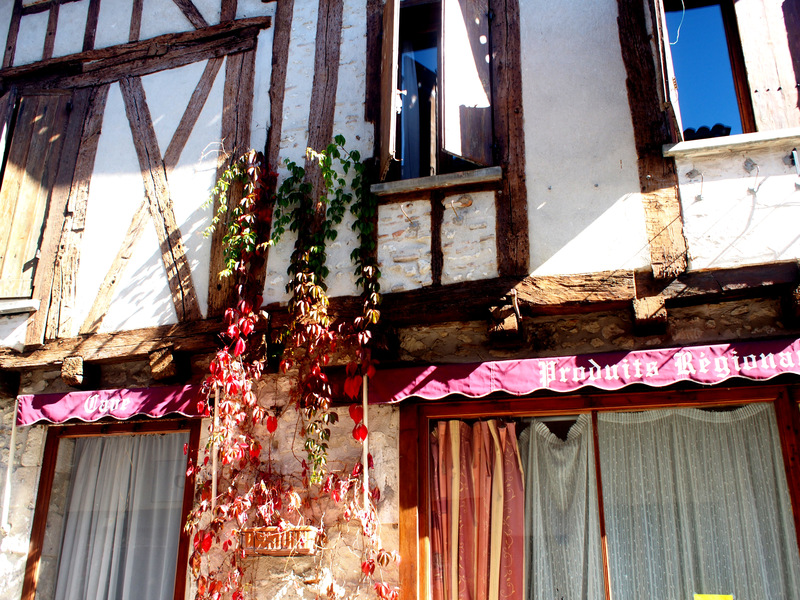 Late September is still warm in the Dordogne and the colours of Autumn paint the walls. Glimpses of cottage gardens, ramshackled and stone-walled. Saint-Léon-sur-Vézère has many picnic tables by the river, an unusual and rare gift in France. Inviting tracks along the river. Can I move in and tend your gardens? The Immobilier( real estate agent), always high on Mr T’s list. St Saint-Léon-sur-Vézère village church with a difference. The castle is privately owned. Next time I visit, I’l stay a while, hire a canoe, walk till the paths run out, and visit the cemetery. But then perhaps beautiful memories should not be tarnished through revisiting. What makes a French village so special? It’s a question that taunts many a traveller. The answer may be found in one of those many photographic coffee table books on the subject or perhaps in the long list published by the association, Les Plus Beaux Villages de France, the most beautiful villages of France. 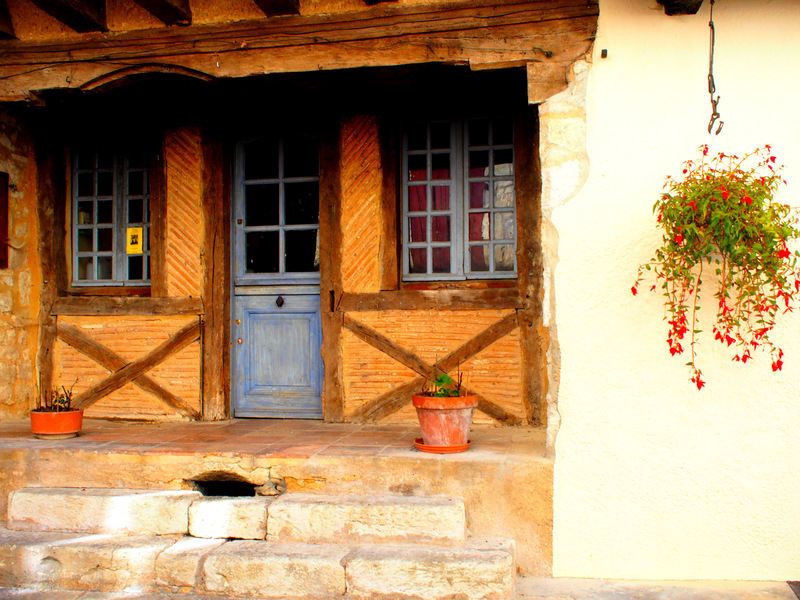 When staying in the Dordogne departement of southwestern France, it’s a delightful and popular pastime to explore these designated Plus Beaux Villages as well as the small but undesignated communes of the district, thus creating your own list. With advice from the hosts of our rental house in Monpazier, Giselle and Jean-Pierre, together with a bit of reading, we embarked on a busy two weeks of driving around the Dordogne and only now, I’m a little closer to answering that question, though I would be quite keen to do some more research on site. Market square, Monpazier, our home village for two weeks. Taller gap between these arched walkways allows a horse with mounted rider to pass through to the square. 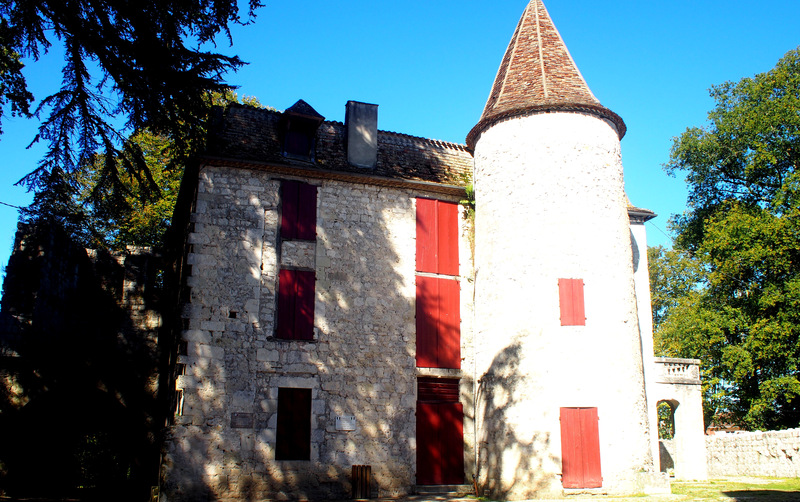 The departement of the Dordogne has its fair share of beaux villages and if we count a few in the neighbouring Lot et Garonne, the list grows longer. Belves, Beynac, Castelnaud- la- Chappelle, Domme, Limeuil, Monpazier, La Roque Gageac, Saint- Amand- de- Coly, Saint- Jean- de Cole, and Saint Leon sur Vezere have received this prestigious title. Most villages have a market day, though after a few markets, you will begin to recognise many stall holders. Still, there will be surprises and very local specialties in each of them. The smaller villages and hamlets not on this list are often more beautiful in many ways. And so back to that question. 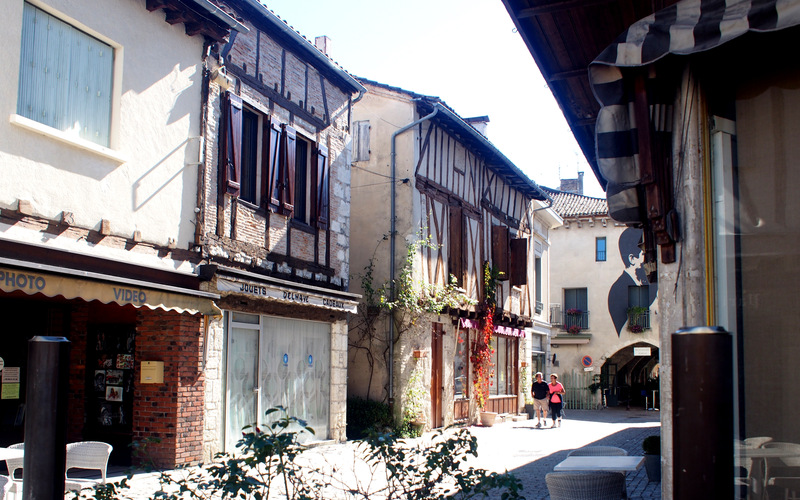 What makes a French village so special? It really does depend on the day. My ‘best of’ list is naturally informed by my own value judgments as no doubt yours would be too. Many factors affect that judgement, such as, the weather on the day, the density of tourists which goes hand in hand with the season, the beauty of the surrounding countryside, the proximity of the village to a river, the attraction of a market in progress, the arrival of a cavalcade of day tourists in small buses, turning your favourite village into a theme park, the blustering cajolery of les Anglais, the Dordogne’s more recent residents from over La Manche who are omnipresent in some villages, congestion or its opposite, deathly quiet, the authenticity of the architecture, signage, cuisine, and friendliness, just to name a few factors. 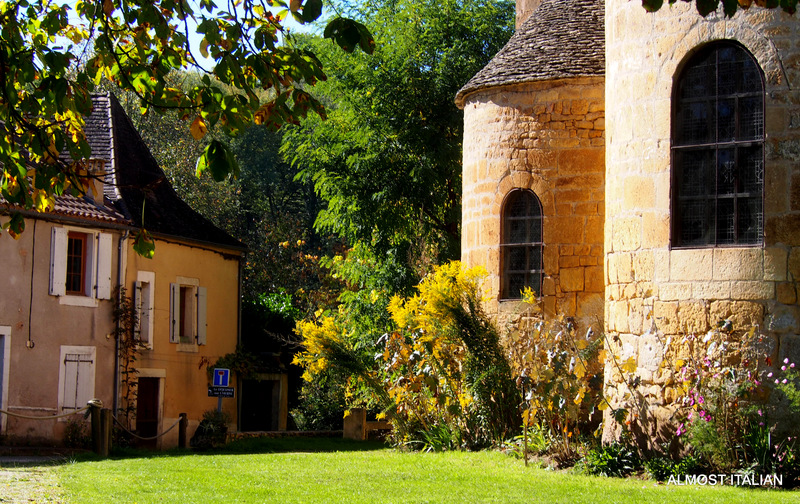 Although food is often high on my agenda, my main interest in this area is medieval history and architecture, as well as following the course of the Vezere river, a most enchanting river, as it winds its watery way through this verdant rural land. Of the 50 or so villages, hamlets and towns that I visited in 2017 and 2011, my favourite villages include Saint Leon sur Vezere, Belves, Monpazier, Issigeac, Limeuil, the small commune of Biron, and the larger towns of Le Bugue and Bergerac. During a visit to this area in 2011, we stayed in Brantôme en Périgord and grew to love that town and the little hamlets nearby. 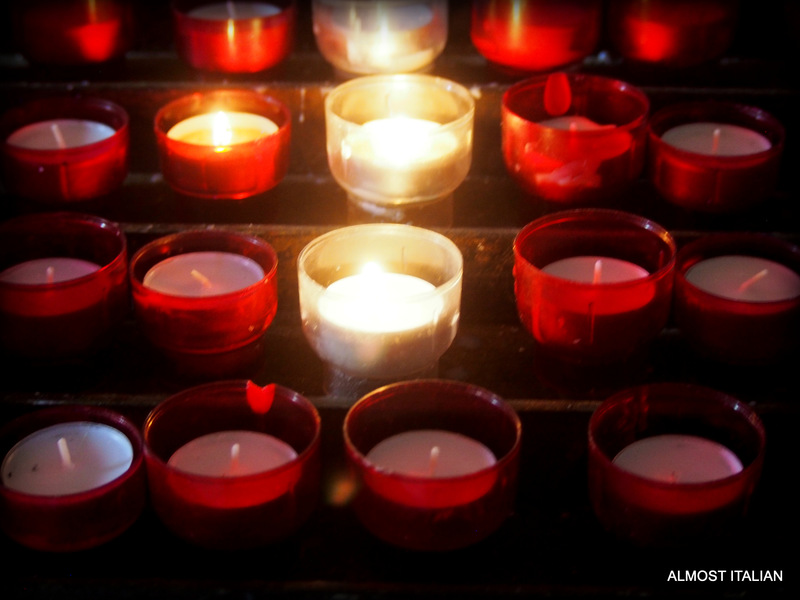 We also have a list of our least favourites, which includes Eymet ( nice architecture but oh- so -English) and La Roque- Gageac, beautifully situated on a steep slope next to the Dordogne river, but frequented by a long procession of bus tour groups. Below, a media show of the picturesque village of Eymet. The history of the region can be read in the architecture, with castles, chateaux, churches, abbeys, bastides, and cave fortresses along with the more modest domestic architecture and streetscapes such as medieval market halls, bastide walls, village squares, fountains, laneways and half-timbered houses. In the long run, it doesn’t really matter where you stay, so long as you have a car to tour the myriad of hamlets, villages, and towns that dot the countryside. 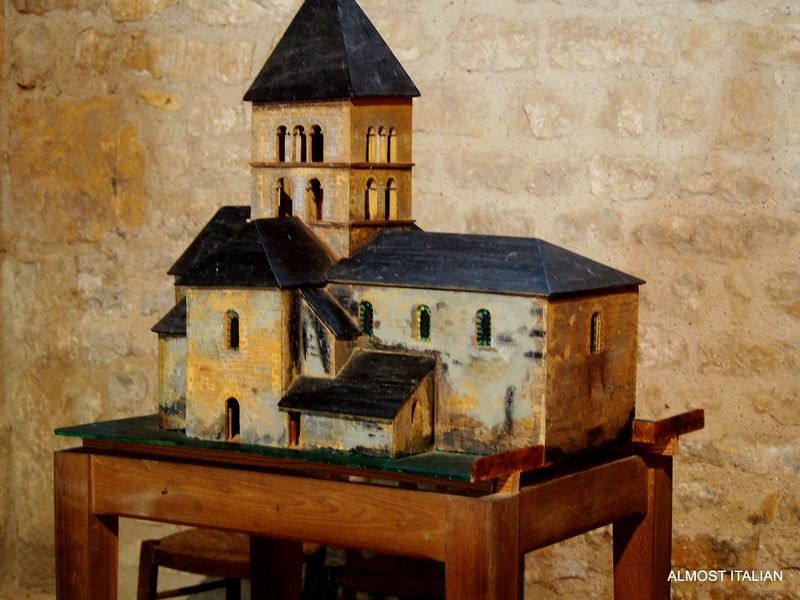 There are 520 communes in the Dordogne, 1500 castles and 18 Bastide towns. So much to see and so little time. More research is definitely required. Wet day somewhere in the Dordogne. For Helen and Chris, who will be there soon enough. 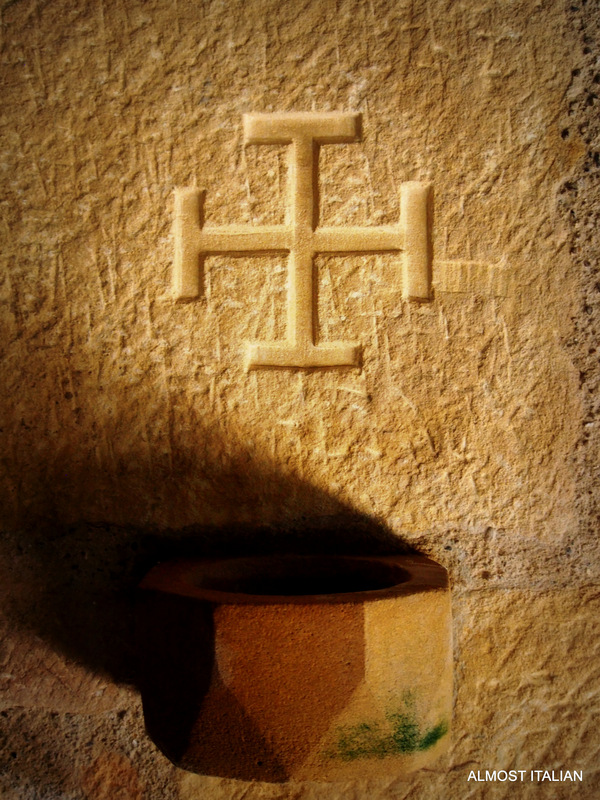 Tomorrow, I’ll return to my favourite village, Saint Leon Sur Vezere. A Village Church at Saint Leon sur Vezere. The Bastide Villages of the Dordogne. Village markets in France roll around once or twice a week, and if you happen to miss your local marché, there’s always another one the following day in a village nearby. I can sense pre- market excitement when I’m staying in a village but maybe it’s just my own eagerness to get there. I must confess, I’m a French market junkie, having been to around a dozen or so over the last four weeks, and I put this down to my greed and lust for good food. I’m in the right country. French markets are integral to life here. Supplies come to your village from the local district: some from the farmers, cheese makers, apiarists, some from local artisans, and of course, manufacturers of cheap clothing. Heading out the front door, with strong bags in hand, and strolling through narrow lanes and medieval arcades, with no car traffic to deal with enroute, is far more pleasurable than heading off to a supermarket by car. If only my local market back at home near Melbourne was as easy to visit, without fear of being run down by speeding tourists keen to park as close to the market as possible. In French country markets, cars are banned: they are parked on the outskirts of the village, allowing easy access for vendors’ vehicles. All shoppers must walk to the market. What treasures will turn up this week? What new seasonal vegetables will be on offer and will I show some restraint for a change? The church bells are chiming 8 am and I can hardly wait. Today’s market in Pezenas, Occitanie, will be interesting. It takes place in a nearby square, a stone’s throw from our 16th century apartment. As I write, I can hear the trolleys being wheeled in through the port below the window. Walnut season necessitating the purchase of a walnut cracker. 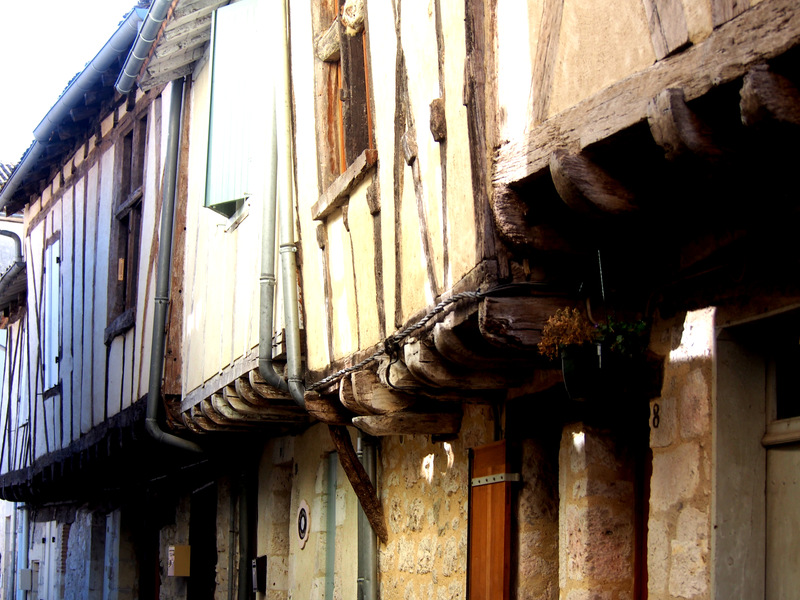 The markets in the Dordogne region varied in size and style. The large and colourful Sunday market at Issigeac was a favourite. 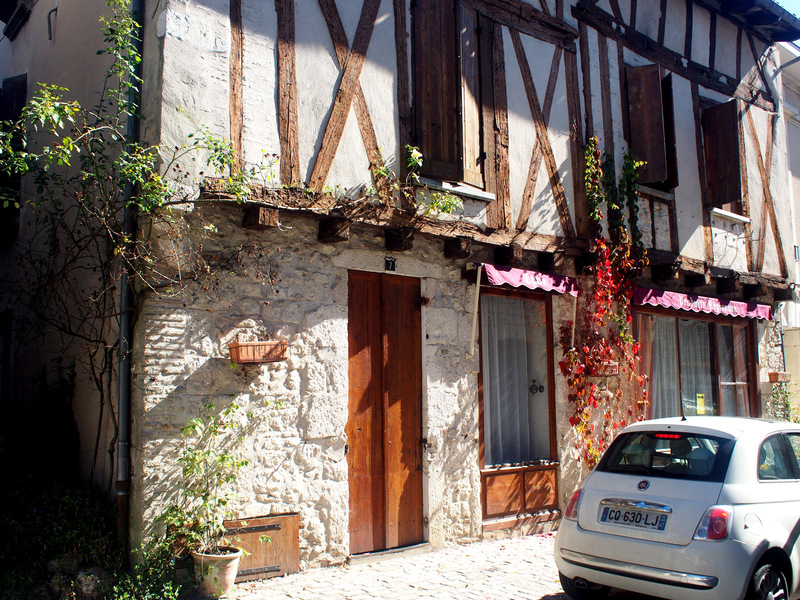 It snaked its way around the narrow and winding village streets in an unpredictable way, given that Issigeac doesn’t have a large market square. All sorts of vendors turned up: the mushroom man, selling girelles, trompe du mort and Cèpes (porcini): a rugged looking duo selling oysters of every size, boxed up for buyers on beds of seaweed, a curly red headed lady with honey and bees wax for sale, who played the squeeze box and sang French folk songs when not engaged in selling, and the usual array of vegetable, cheese and saucisson stalls. The most delicious mushrooms, Cèpes. Ne Pas Toucher, Mischa Belle. Miel. Local honey in the Dordogne. Our honey pot, tasting of woods and flowers, was a gift from our landlord, Jean Pierre, from his own bees. The Thursday market at Monpazier ( it has always been held on Thursdays since the 13th century ) was much smaller, though on one occasion, a mattress seller took pride of place in the square and I did rather fancy the knife sharpening man, a skill that is slowly dying. The big town market at Bergerac encircled the town’s cathedral, then radiated uphill along adjacent streets. A huge christening ceremony took place one Saturday while the market was in full swing, the shoppers and vendors forming a row of honour as the family and baby arrived. There were little stalls selling sweet canelè in every flavour, lots of walnut stalls, chestnuts, and a substantial flower market. The Saturday market at Le Bugue, right on the Dordogne, sold the best Paella, cakess and quiches and the huge poissomiere truck did a roaring trade. I purchased a small tub of brandade to spread on croutons: this is one dish I never bother to make at home given the tedious soaking of salted cod required. Not for sale, otherwise they would now be in my suitcase! In each market you’ll usually find a separate area where cheap clothing, linen, shoes and handbags are sold. These stalls are appealing at first, then after a while, you recognise the same garments at every market- this season it’s oversized knitted sloppy joes, women’s tops with large stars on the back, and retro looking cotton tops with a lot of glitter and sequins. One of the other features of the village market, and one I’m too shy and too foreign to join, is the footpath café scene. Coffee and wine are sipped slowly, double or triple kiss greetings take place as locals gather to catch up, though you can always spot a French poseur or two, and a few expats trying very hard to appear local. I’ll head to the Café des Arts in the late afternoon for a Pastis. I’ve acquired a taste for this old Provençal drink. I’ll wave about an imaginary Gauloises and if chilly, I may even don my new fingerless gloves or perhaps a beret. Bonne journée. Take away seafood paella. One metre wide paella dish. This is my list for Languedoc/ now Occitanie. The Francophile files. Another Lunch, Monpazier. Four years ago, almost to the day, I began ‘Almost Italian’ in an attempt to document my obsession with food along with some of the cultural aspects of Italy that inform my life, my cooking and gardening. Since then, I’ve drifted away from my main theme, especially when travelling, and so I hope, dear reader, that these little indulgent travel stories are a pleasant distraction from whatever you are doing. Once I step back into my home and garden, the recipes will flow once again. I’ve enjoyed the food of Dordogne, France, immensely. Everything I’ve eaten, with only two exceptions, has been quite special. Small restaurants and bistros respond enthusiastically to the seasons, and so a trip around a French country market will indicate what you’ll see that week on any menu. This season, cèpes ( porcini mushrooms) are still being hunted in the woods, pears and apples are sold ready to eat, kissed by the Autumn sun, irregular in shape and handsomely mottled. Small yellow fleshed potatoes are good just as they are, or with some salted butter from up Brittany way. Small bunches of parsley are added to your fish purchase, a box of oysters will be laid gently of a bed of seaweed, and vegetable stalls offer bunches of bouquet garni, consisting of thyme and bay laurel, for a small coin. This month, many bistros list omelette aux cèpes, which may seem like a simple enough dish, until you notice that fresh cèpes cost around €22 per kilo at the local market. I bought a small box and the flavour will haunt me forever. Walnuts turn up in every sweet dish imaginable, tarts, macarons, biscuits, as well as fresh walnut oil, which I resisted buying. Organic food is sold in markets, farmer’s roadside stalls and on supermarket shelves: there’s nothing precious about it- it’s a choice that doesn’t involve a huge premium or a special stamp of approval. What I’ve loved most about French bistro food is the saucing, a technique that the French are famous for. A well executed sauce transforms a simple fish dish. The French are also reasonably adventurous and don’t stick to the formulaic dishes of the region but happily borrow and adapt from modern culinary trends, while maintaining a French slant. The three course menu du midi, above, cost €21, which seems like a real bargain to an Australian reader, where restaurant dining and wine pricing is ridiculously expensive. But then, wages are much lower in France, and waiting staff are usually run off their feet. Posted on October 17, 2017 October 17, 2017 Author FrancescaCategories UncategorizedTags Bistro food, Dordogne, France, French bistro, French cuisine, frenh markets, menu du jour, Monpazier, Privilège du Périgord, seasonal cooking15 Comments on The Francophile files. Another Lunch, Monpazier. Ambling through a medieval bastide village at lunchtime, the only sound I hear is the fluttering and soft cooing of pigeons in the belfries and rooftops above. 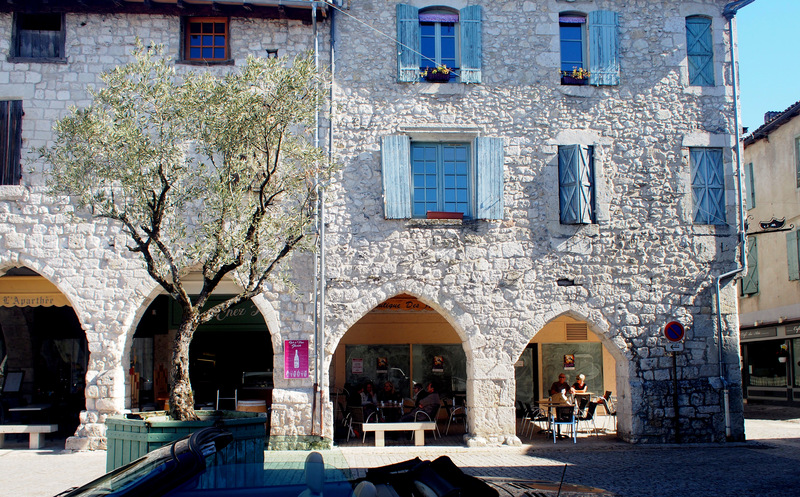 It’s a soothing murmur, and one I always associate with the quiet lunchtime villages of France and Italy. Not a soul in sight. Just as well I’ve packed a picnic lunch. Shuttered windows, some slightly ajar, block out the prying eyes of the street or the harsh glare of Autumn light. Others are fully closed, now that the summer season is over. 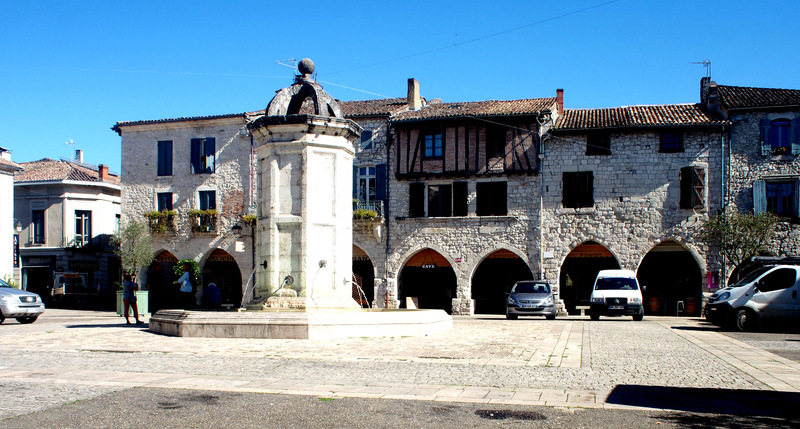 Noted for their grid pattern, fortified walls, archways and central market squares, bastide towns were built in the late 13th and early 14th centuries, and alternated between English and French control during the 100 years war. Handsome arched entry ‘ports’ invite the walker to explore within, where il fait bon flâner, wandering about aimlessly, is a pleasant way to spend an afternoon. Each village brings new surprises: medieval architecture, fantasy ruins in need of loving restoration, shadowy narrow lanes, or carreyrous, that crisscross the gridded layout, high stone benches overlooking wooded valleys below, framed views through darkened archways, doors, keyholes, miniature windows, mossy tiles, shutters, I can never get enough. After the long postprandial silence, which can last from around 12.30 to around 5pm, life returns to the village: the local bar reopens and chairs spill out once again onto the square as locals meet for a coffee or wine. The boulangerie reopens, there’s more bread to be sold. Strollers take to to the streets. 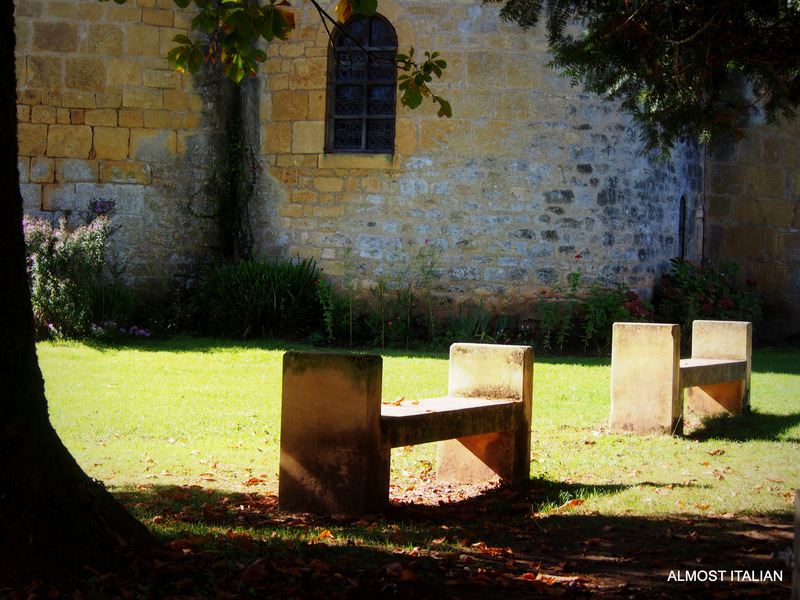 Monpazier, the village of our current rental house, is considered to be the most well-preserved bastide town in Dordogne. 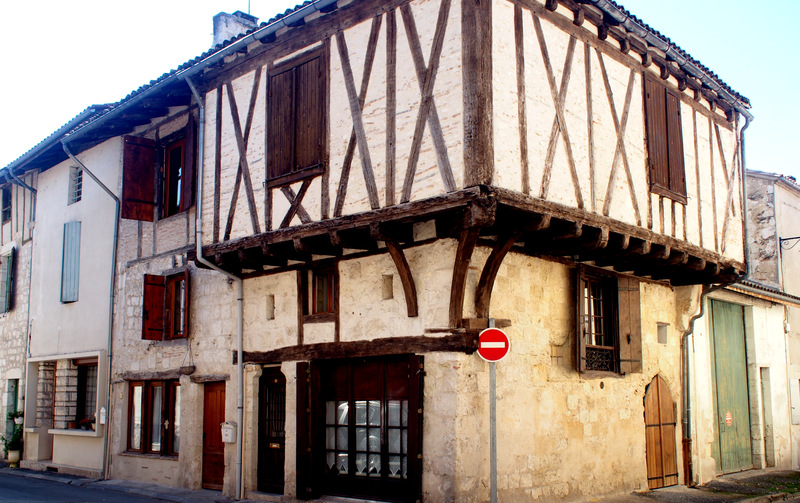 A 13th-century bastide town, it begun in 1285, founded and built by King Edward 1 of England, who was also Duke of Gascony. The town was also home to Eleanor of Aquitane and Richard 11 of England for a time. After the 100 years war, the town returned to the French. Today, the English are back, they love the villages of the Dordogne. They, and expats from other countries, now occupy a significant number of the local houses. The owners of our beautiful rental house, ‘Les Portes de la Bastide’ made this very clear when we arrived. It annoys them to hear English spoken by some vendors at the local markets around the Dordogne. To be able to say ‘Je viens d’Australie’ has its advantages here: we have an excuse for speaking the language so badly, unlike those who live a stone’s throw away across the channel. To be fair, most English expats speak French very well. There are 18 bastide towns in the Dordogne region as well as all the other small villages that demand a visit: the designated ‘Les Plus Beaux Villages de France‘, small stone hamlets, a sea of ochre coloured stone and carmine creeping vines, towns that rise above the confluence of the Dordogne and Vezere rivers, larger towns like Bergerac, still with medieval hearts, and the occasional chateau. Every day is a feast of discovery. I swear each village is more charming than the last, and then I want to re-visit them all on market day. Two weeks will not be long enough in this region of France. Beaumont-du-Périgord, Beauregard-et-Bassac, Bénévent, Domme, Eymet, Fonroque, Lalinde, Molieres, Monestier, Monpazier, Puyguilhem, Roquepine, Saint-Aulaye, Saint-Barthélemy-de-Bellegarde, Saint-Louis-en-l’Isle, Vergt, Villefranche-de-Lonchat, Villefranche-du-Périgord. 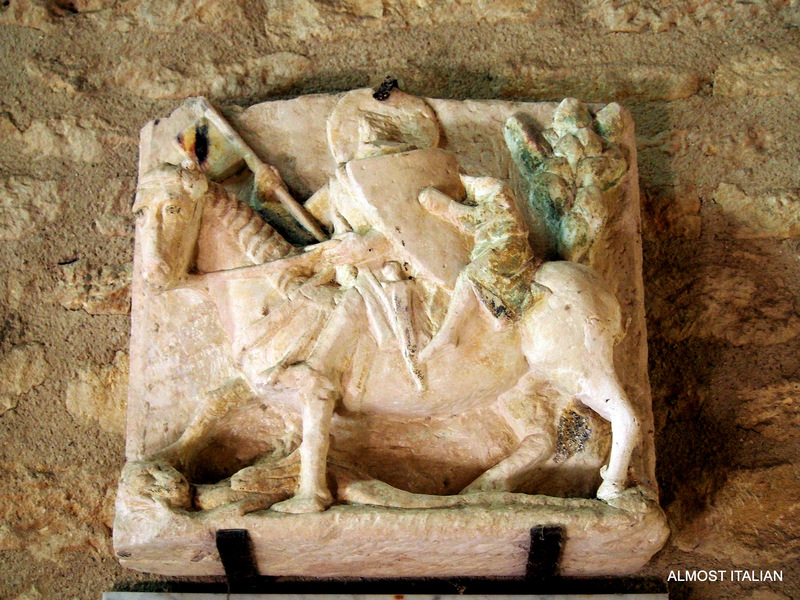 Aiguillon, Damazan, Castillonnes, Durance, Miramont-de-Guyenne, Monflanquin, Montpezat, Penne-d’Agenais, Puymirol, Sainte-Livrade-sur-Lot, Sérignac-sur-Garonne, Villeneuve-sur-Lot, Villeréal. “Hey Mr Marie, Can I stay at your Hôtel de Ville?”my son Andrew, circa 1985.